If you need medical help fast, but it’s not a life-threatening situation, you can call NHS 111, this service is free from landlines and mobiles. When you call 111, a trained adviser will ask you questions to find out what’s wrong, give you medical advice and direct you to someone who can help you, like an out-of-hour doctor or a community nurse. If the adviser thinks your condition is more serious, they will direct you to hospital or send an ambulance. If you don’t speak English, tell the adviser what language you want to speak and they will get an interpreter. 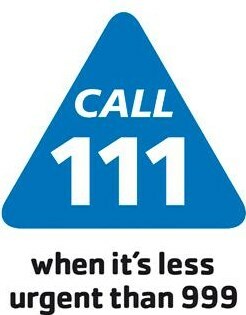 You can call 111 anytime of the day. Your local pharmacist will be able to give you free health advice at any time – you don’t need an appointment. The Pharmacist is also able to issue emergency medications until you are able to see your own doctor. Many pharmacies operate extended hours on a rota basis. Walk-in Centres are GP led health centres - open from 08:00 – 20:00, 7 days a week. Hartlepool’s walk-in centre is at One Life Hartlepool, Park Road, Hartlepool, TS24 7PW (01429) 890947. Stockton’s is at Stockton NHS Healthcare Centre, Tithebarn House, High Newham Road, Hardwick, TS19 8RH (01642) 525480. For treatment of minor injuries without an appointment, a Minor Injury Unit is available in Hartlepool at One Life Hartlepool, Park Road, Hartlepool, TS24 7PW (01429) 285805. It is open 24 hours a day, 7 days a week. A&E is an emergency service that should only be used when people are badly injured or show the symptoms of critical illness. Teesside’s A&E departments are at University Hospital of North Tees, Hardwick Rd, Stockton TS19 8PE and James Cook University Hospital, Marton Rd, Middlesbrough, TS4 3BW. A&E is not for minor injuries such as small bumps and cuts or minor illnesses such as coughs, flu and earache or for illnesses which you have had for a number of days. 999 is an emergency service that should only be used when people are badly injured or show the symptoms of critical illness.